Water slides make pools more fun for kids and adults alike. VistaPro designs and install pool water slides in Annapolis, Maryland, to compliment your home and your outdoor décor, while also creating an extra fun space. Design your water slide in any size or at any place around the pool so you can your family can get the most out of every summer. Whether you are installing a completely new pool space, patio and landscaping, or you want to add a pool water slide, we can help. Pool water slides can be fun and safe as well as attractive. 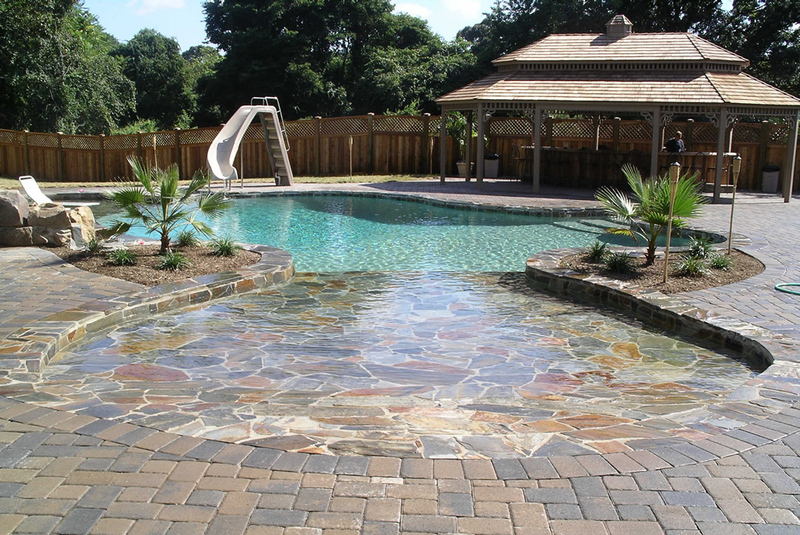 We will add a pool water slide that matches the materials of your patio or your rock formations and install a slide that fits seamlessly with the rest of the landscape. We make sure your slide is safe, that it will not cover up other attractive elements such as waterfalls or gardens, will not break up the flow of your space, and it is easy to use again and again. Make your slide a part of rock formations to make the space feel more natural, place near a diving board for extra entertainment or place next to a waterfall for even more fun and excitement. Whatever you have in mind, we can build it. Install pool water slides this summer and enjoy your pool area even more this year. Contact us today to start designing.